Nice images, ephemeral, gently there. These pictures are amazing. It’s complicated to find a title! Lovely. The drawing with Mylar is glorious! I sense a another series that takes advantage of your marvelous photos…. Thank you, Elena. The Mylar isn’t actually added at this point – who knows how it will transform? I am having fun playing with this series in both drawing and photography, anyway! Thanks very much, Marina. These drawings will be transforming somehow. Very nice shots. These comb jellies are beautiful even in monochrome. Are you a biologist or is this just hobby? A biologist, no. I am an observer, I guess. These are things that interest me and I was looking through photographs I had taken for reference – for art making – I thought these might be worth posting. Mainly because I love the forms, but also because they are connected to the things I think about in my art. Fascinating and that final blueish image is seems to be from another dimension. Just beautifully done, all of it. Thank you, Steven. The drawing is a work in progress/process. Yes, we shall see how they develop, I am enjoying the subject. Lovely and very curious little lives, aren’t they? Your drawing is so beautiful – diaphanus itself. They are curious looking for sure. Maybe that’s why I find them interesting. Thanks for the kind words about my drawing it’s just a start, really. It looks finished to me, Karen. I took three courses in printmaking in the last two years and my teacher encouraged us to know when to stop, when not to jump off the cliff, so to speak. Some things are finished in their simplest form. Somehow we know when they are complete. You make art of nature. Love it! Such wonderful, delicate little objects. Your drawing captures them and takes them onto another stage in their journey. The layers hold them gently in place. They are an interesting subject, I think. Thanks for your encouragement, Anna. I’ll be developing the drawings more this week. I like the title. Of course, i’m thrilled by your vision even more. I have truly enjoyed this set…. I’m glad you enjoy these jellies, Alessandro, thank you! a wonderful and inspiring study Karen! Hmm. I was expecting pictures of pudding! How fascinating – they are like living scribbles! I love your underdrawing, Karen – nice tension between the jellies’ vivacity and the schematic. Thanks for your comments, Richard. i like the idea of living scribbles. : ) That would have been a better title! Beautiful, visceral, alive! Just the inspiration I seek. Ah, that’s a nice comment, Brenda. Thanks very much. Amazing! I love the way you have presented them little circular studies, and your knowledge of your subject just completes the picture. Fascinating stuff. Thanks, Emily. I’m happy you find them interesting. Wonderful forms. So calmly flowing, so complex yet convincingly simple. Very interesting work. Thanks for sharing! They are interesting forms, I’m glad you liked looking at them. Thanks for your comments, Roland. I always find it very inspiring to find such views of the everyday world. It helps me open the mind and eyes. wonderful! You are learning in so many different ways. They could all be drawings . I am curious how you will develop the drawings. I’m not sure if the last on completely your drawing? Keep going 🙂 Your work is getting more delicate and my paintings are getting more solid I’d guess one could say. Hi Carla, I’ve been mounting Mylar over the drawings and doing new drawings on top, and adding some thin layers of paint too. The under-drawings become ghost drawings. Thanks for your comments. 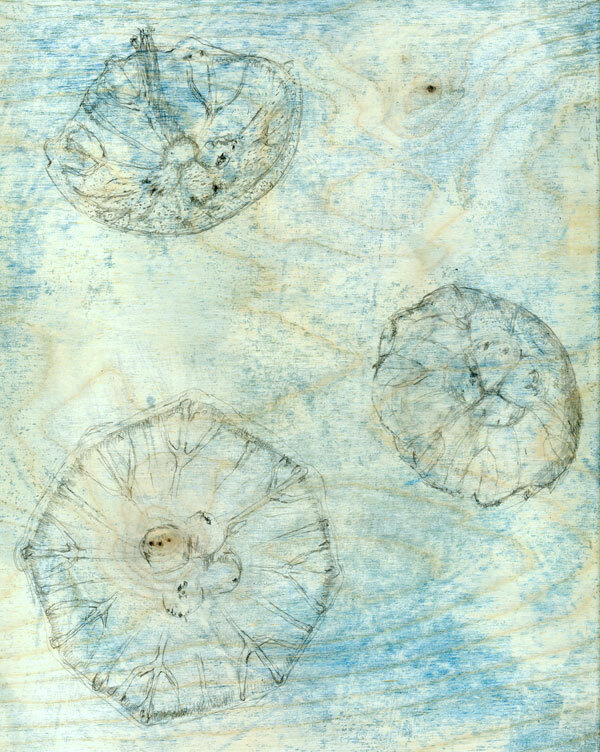 Thank you, Massimo, those little sea jellies make nice art! what i mean is how did you take them? I took them with my regular camera (digital SLR) and a 60 mm macro lens. The jellies are really small; I just scooped them up in a white bucket and took many, many photographs. The white background acts as back-lighting since the jellies are mostly see-through. I usually use manual focus and adjust the ISO and other settings for the lighting conditions. I underexposed just a little so I wouldn’t blow out any highlights. There isn’t really any special equipment used – anyone could take this sort of image with a macro lens. wow. i thought this might have been in an aquarium. Fantastic! I’m fascinated with the patterns and shapes of microorganisms and cells of larger creatures, including us. I love these Karen. Very microscopic, in the sense that they could have been shot through one.